Made for only $9 million back in 1988, and garnering a modest $45 million at the box office, this story of a broken family who is suddenly terrorized by a serial killer doll was so well made, that it still conjures up scares and a rollercoaster of thrills. Playing to the hit real-life toy of the 1980s – My buddy, the big rage in toys in the film was a Good Guy doll that blinked its eyes, moved its head and said a variety of helpful and loving phrases. 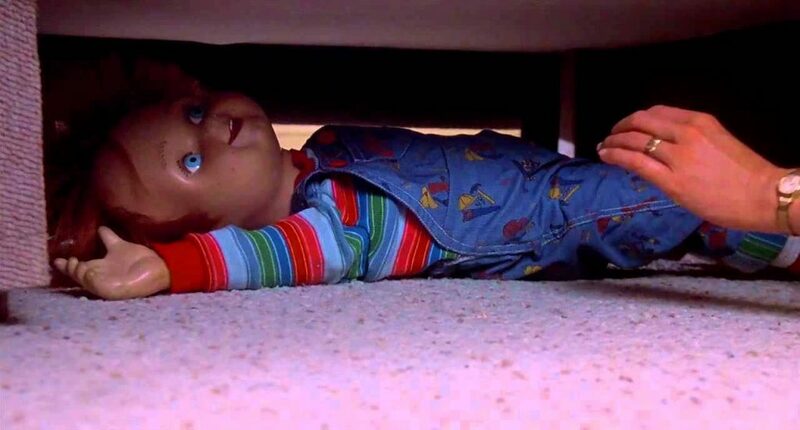 A serial killer by the name of Charles Lee Ray was in a shootout with police at a toy store and as he lay on the ground dying, he recited a voodoo chant that transferred his living soul and mind into one of the Good Guy dolls. This tainted doll ended up in the hands of an eight year old kid named Andy and his mother Karen for his birthday. Soon enough, this doll is killing people and finds out that he has to say the same voodoo chant over the first person he told his secret to, this setting a horror thrill ride in motion. What’s so great about this film as that there is ample time to set up the characters to where you care about them and see what innocent lives they live, until blood starts flying left and right. Another great aspect to ‘Child’s Play‘ is that it is more of a police investigation/psychological thriller with an element of horror to it. 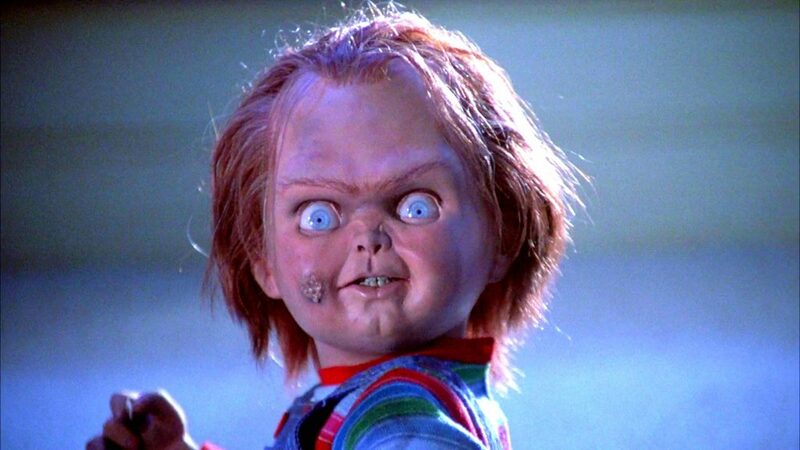 All of these aspects mix very well together due to the screenplay and performances by all the actors including the young Alex Vincent, Catherine Hicks, Chris Sarandon, and voice of Chucky – Brad Dourif. It’s not until the middle of the film until we really get a glimpse of the killer side of Chucky, but when it happens, it is sure terrifying. The visual effects for the time were fantastic as it mixed puppeteering, animatronics, and real life actors to play the part of Chucky, and nobody since this film has created such a a great looking horror doll film with this much terror and suspense. The film still holds up today and packs a ton of great and memorable moments. ‘Child’s Play‘ comes with a new 1080p HD transfer, which is encoded in 1.85:1 aspect ratio. This transfer was created from a 2K resolution scan of the interpositive. Wait, wasn’t there a Blu-ray release of this film only a few years ago? Yes there was, but this video presentation from Scream Factory is far superior to the previous MGM release. There are still some small issues here and there, mostly from the source of this almost thirty-year old film, but overall, this is one hell of a video presentation. Detail is sharp and vivid, showcasing every strand of red hair on Chucky’s head to the fine plastic imperfections and freckles on his doll body. Other bloody wounds and beads of sweat on the human actors look excellent. The 80’s clothing also great with fine stitching showing up in every scene. Wider shots of the city of Chicago also look impressive from all of the brick and stone buildings. There is a great layer of grain as well throughout that fluctuates from time to time in to heavy territory. Certain scenes, mainly the darker lit scenes look a bit worse for the wear, but this is mostly a source issue and not a transfer problem. Colors seem to pop off screen in the well-lit exteriors and interiors with excellent primary colors from the blue and red Chucky outfits to the red blood and yellow packaging of the Good Guy doll. Black levels are mostly deep and inky, but there is some crush to the image. There are certain scenes where the film gets a bit fuzzy at times, but again this is source related. There were no major issues with banding, aliasing, or video noise here, leaving this excellent 2K presentation with great marks. This release also comes with two different audio options. One of them is the original 2.0 stereo option, and the other is a lossless DTS-HD MA 5.1. The stereo option is excellent, but the 5.1 version is the one to go with, because you get all of the rear speaker immersion, which Scream Factory has enhanced, meaning it will sound like Chucky is right behind you here. The sound effects are great with some powerful gunshots, windows breaking, and even the pitter patter of footsteps. All of this sounds excellent in the 5.1 version, as it sounds like the killer doll is somewhere in your viewing room. Ambient noises of the city, Chucky walking around, and bullets flying by all come through nicely on the surround speakers. The score is always haunting and chilling, and always adds to the suspense, but never drowns out any of the other sound aspects out. The bass kicks in nicely in the heavier action and horror scenes as well. Dialogue is always crystal clear and easy to follow, and always free of pops, cracks, and hiss. There were a few shrilly moments here and there though. Still, this is a great audio presentation. All of the previous extras from the last release of the film are imported here along with some new bonus features, exclusive to this release for the time being. Audio Commentary #1 – This is an all-new commentary track with director Tom Holland as he enthusiastically discusses making this film some thirty years ago. He talks about helping with creating the look of the doll, working with the child actors and the adult actors, as well as the many different Chucky dolls used for the film. This is very fun and informative on the creation of the film. Audio Commentary #2 – This second commentary is with actors Alex Vincent (Andy), Catherine Hicks (Karen) and the Chucky designer Kevin Yagher. Alex Vincent was recorded separately here, but is put in the mix with the other two who actually met on the set of the film and got married. They are still together. The three talk about their time making the film, fun anecdotes from the set, and how well the fans have reacted over the years to the movie. Audio Commentary #3 – The third commentary track has producer David Kirschner and writer Don Mancini talking about the film and which story lines and scenes were changed in the final production. The score is elaborated on as well as some of the characters and plot devices. Great listen. Audio Commentary #4 – This is probably one of the GREATEST extras on any disc anywhere and I wish more movies would incorporate this kind of commentary with their films. This commentary track has Chucky in character (Brad Dourif) talking about the film. It’s hilarious as Chucky loves remember his first kills and how he accomplished all of them. Unfortunately, this is scene specific commentary, meaning there are gaps in between when Chuck speaks. Don Mancini joins the conversation as well with Chucky later on in the film, which is pretty funny. Special Effects Footage (HD, 60 Mins.) – This is a cool extra that shows just how Chucky was made and the various forms he was in, including the animatronics version, the puppet version, and the live-actor version and everything in between. Howard Berger: Your Special Effects Friend ’til the End (HD, 41 Mins.) – This is an excellent interview with the visual effects makeup artist and master Howard Berger and what he did to make Chucky come alive. Life Behind the Mask: Being Chucky (HD, 40 Mins.) – The short actor Ed Gale, who played Chucky in a suit in certain scenes discusses working on the film and with the wonderful actors. Excellent interview. Evil Comes in Small Packages (HD, 25 Mins.) – This is a three part bonus feature with Part I having interviews with the cast and crew, discussing the overall story, tone and being cast in the film. Part II talks about shooting in Chicago during the coldest winter in years as well as all of the animatronics of Chucky that were possible. Part III has the filmmakers talking about the premiere of ‘Child’s Play’, the audience reactions, and making Chucky the iconic horror monster he is today. Chucky: Building a Nightmare (HD, 10 Mins.) – Here is a more in depth look at the visual effects for bringing Chucky to life with some awesome behind the scenes footage of how the doll worked, as well as some other visual effects masters chiming in on how much they love the movie, Chucky, and Kevin Yagher. A Monster Convention (HD, 5 Mins.) – This is an all-too short Q&A at the Monster Mania 2007 convention, which has Alex Vincent, Catherine Hicks, and Chris Sarandon talking about the film. Introducing Chucky: The Making of ‘Child’s Play’ (HD, 6 Mins.) – Here is the old school promo reel for the film from the 80s. Vintage Featurette (HD, 6 Mins.) – Yet another vintage promo reel for the making of the film with more interviews and behind the scenes footage. Trailers (HD, 5 Mins.) – A couple of trailers for the film. Photo Gallery (HD) – A ton of photos from the set of the film. 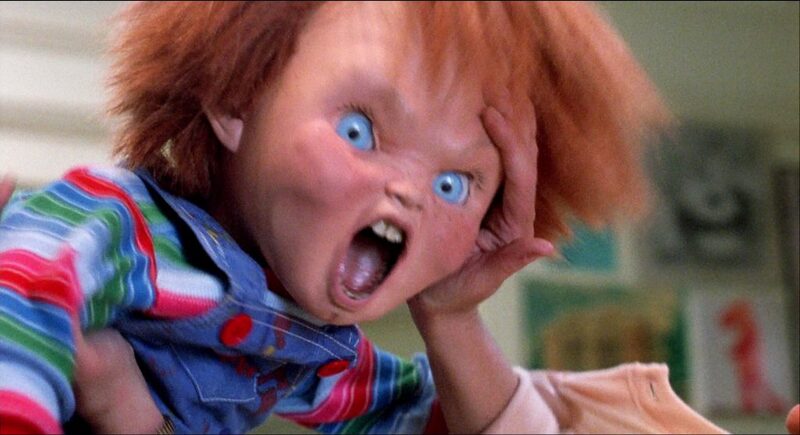 I can’t believe it’s been almost thirty years since ‘Child’s Play‘ was released upon the world. Not only that, but that excellent first film, spawned a ton of sequels and a horror icon that can stand tall with the likes of Jason Vorhees and Freddy Krueger. The film itself is fantastic and has stood the test of time and is still scary, thrilling, and a bit funny. The visual effects are still excellent as well. The new video and audio presentations are both awesome are the best they have ever been. The treasure trove of extras are all worth listening to as well as watching. This Collector’s Edition from Scream Factory is a MUST-OWN for horror fans! This entry was posted on Monday, October 17th, 2016 at 4:29 pm	and is filed under Film, News. You can follow any responses to this entry through the RSS 2.0 feed. You can skip to the end and leave a response. Pinging is currently not allowed. « Warner Bros. Offers 4 Films Converted to 4K Ultra HD Blu-ray This Holiday Season!! !